This breakfast bake makes a great brinner (breakfast for dinner) or you can prepare it on a Sunday night and have your breakfasts set for the week! You can also tailor this recipe to your favorite foods and really make it unique to you. The first thing you’ll need to do is to cook your breakfast sausage. I did this in a large pan over medium heat. Once it’s fully browned, drain the grease from both the pan and the meat by dumping the pan onto a plate covered by a few paper towels. I decided to just use the same pan for my bake so I let the pan cool and wiped up most of the remaining grease, leaving just enough so my bake wouldn’t get stuck. Preheat your oven to 400 degrees Farenheit. Next, crack 8 eggs into a medium sized bowl. One with a pouring spout will help later on. Then, add your salt, pepper, hot sauce, milk and half of your cheese. Whisk this mixture thoroughly and try to get as much air into the mixture as possible so you’ll have a nice fluffy bake. Spread your breakfast sausage crumbles evenly around the base of your pan (or casserole dish). Cover this with your egg mixture and place in the oven for 25-30 minutes. I did about 20 minutes and then covered the bake with my remaining cup of cheese and reduced the heat to 325 degrees Farenheit. Once you’re done cooking, you can serve immediately with a topping of sour cream and green onions or store in the refrigerator for later meals. I’ve got to say, this does make a teriffic and filling start to your morning! 3 Dips that are a Slam Dunk! 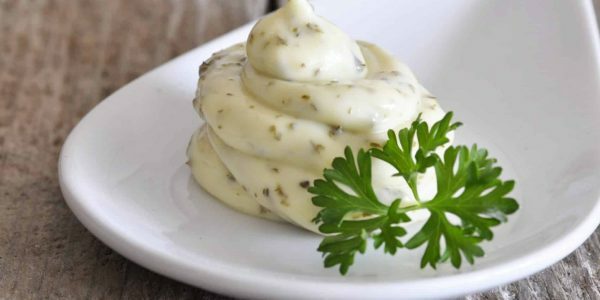 The Association for Dressings and Sauces (ADS) was founded in 1926 and represents manufacturers of salad dressing, mayonnaise and condiment sauces and suppliers of raw materials, packaging and equipment to this segment of the food industry. Its purpose is to serve the best interests of industry members, its customers, and consumers of its products.